You may register in person or online. A class supply list is available online under the class section and in the store. You receive a 10% discount on all class supplies. Remember to request your 10% discount when buying supplies for J. Madeline’s classes. If a pattern is required, each person taking the class must purchase their own pattern. No sharing is permitted due to copyright issues. 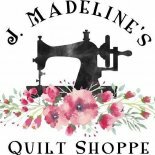 J. Madeline’s Quilt Shoppe reserves the right to cancel any class. If your class is cancelled, you will receive a full refund. If you must cancel, you must do so at least 7 days before the first day of class. You will receive a credit to be used in the store or toward another class. Cancellations, for any reason including illness if less than 7 days will result in forfeiture of class fees unless we can fill your spot. Please be considerate of your teacher and other class members; leave children and guests at home. We ask that you please not wear any perfumes due to possible allergies of other students and instructors. Please arrive on time and be prepared with class materials. Please put all cell phones on silent. If you must take a call, we ask that you step out of the classroom. The only beverage allowed in the classroom area is water in a resealable container.